Publishers have found yet another way to harness all that dark, brooding Twilight energy and transform it into chart-toppping sales - this time of gothic classic Wuthering Heights. A new British edition of the 162-year-old work has risen to the top of the classics bestseller lists, selling nearly twice as many copies as the Penguin Classic edition. "Love the Twilight books? 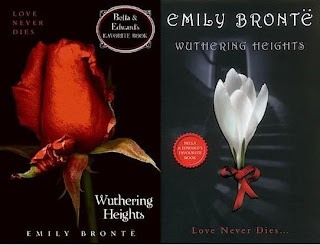 Then you'll adore Wuthering Heights, one of the greatest love stories ever told," British bookstore chain Waterstone's advertises. "Cathy and Heathcliff, childhood friends, are cruelly separated by class, fate and the actions of others. But uniting them is something even stronger: an all-consuming passion that sweeps away everything that comes between them. Even death!" But not every new reader has been impressed by Emily Brontë's novel, new cover notwithstanding. One reviewer on Waterstones.com wrote: "I was really disappointed when reading this book, its made to believe to be one of the greatest love stories ever told and I found only five pages out of the whole book about there love and the rest filled with bitterness and pain and other peoples stories through out." Another added: "Just a question to anyone who has read this book is it in old english or mordern understandable english? if so i want it but it sounds like it's just the original version with a different cover."